Short and sweet, this half hour lunchtime show feeds feisty and giggly kiddies with a banquet of characters performing a range of tricks. 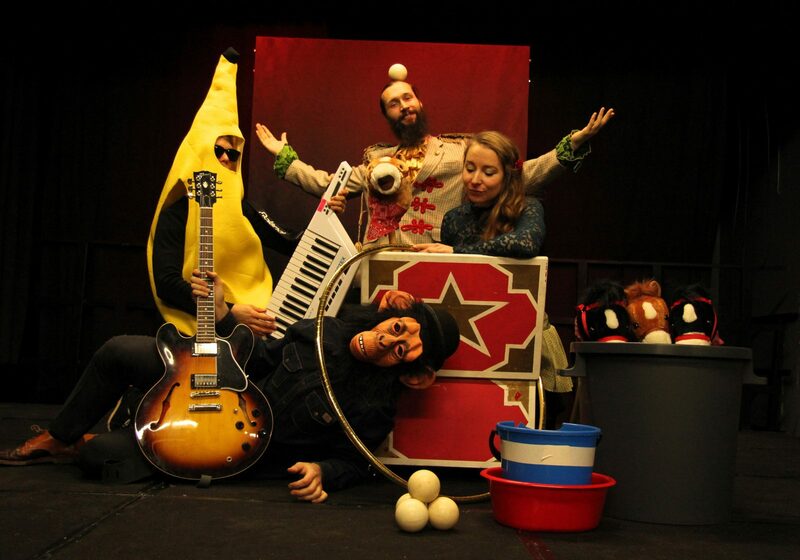 A bearded ring master charms a female acrobat snake out of a trunk, and two musicians run around in monkey and pyjama costumes as their underage audience scream and shout at them. Programmed for the Easter holiday, the work is a strong contender among the ever-growing popularity of children’s theatre in London. Particularly special is Jackson’s Lane support for circus, which enriches their programming and sets a precedent for accommodating circus in small theatres. Race Horse Company from Finland perform Around with circus artists Kalle Lehto and Susanna Liinamaa and musicians Ben Rogers and Sami Tammela in a series of acts loosely based on a big top circus. Tumbling and break dance floor work create an untamed hobby horse marathon as one by one the horses try to throw their riders and fly over imaginary jumps. A juggling section takes off as Lehto uses white juggling balls in a composition that varies in pattern and tempo with live music. Using static moments with balls balanced on the head and face, and a constant changing in direction and size of arc, ups the pace of the show. The magic is topped with a charming and sophisticated bubble blowing solo which returns later as part of a seaside diving scene with Lehto diving towards the bubbles and balancing, falling, or rolling away. Liinamaa’s sinuous arm extensions make bubbles from giant rings, rope or purely from her palms. They create magic balls that roll over her body, sparkling in the low light as if they are about to reveal our future. There is a disconnect between both incarnations of the bubble work that can be tied together through a tighter grasp of their existing themes and narrative. These sections are the strength of the work and deserve development into fuller scenes. An unpolished, masked elephant procession enthralled children but is not enough to make the cut of a piece worthy of both adult and child admiration. The snake charmed from her box has the potential to pack her movement phrase with more interesting motifs and dance vocabulary. Ending with a crescendo of spinning hula hoops, Liinamaa’s routine sees four then six hoops orbit her body and limbs simultaneously in a colourful and exciting ending. For audiences that have a well-informed grounding of circus, there is nothing new to be found in Around, however for first timers and younger viewers it forms a rich introduction and a lively Easter treat for families. Around runs though 13 April.